The DTPSU50 series of AC/DC desktop power supplies offers 50 watts of output power in a 5.75” x 2.97” x 1.69” compact package. This series consists of dual or triple output models with a universal input voltage range of 100~240VAC. Two different AC inlets are available: IEC-320-C14 or IEC-320-C6 and there are also optional output connectors available. This series has short circuit and over voltage protection and UL 1950, CSA C22.2, EN60905-1, and IEC60905-1 safety approvals. Notes: 1. “X” in model number indicates the AC Inlet. “X” can either be “A” for IEC-320-C14 inlet or “B” for IEC-320-C6 inlet. 2. 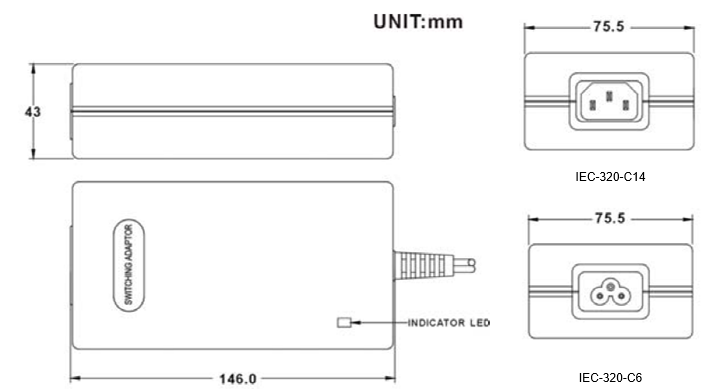 Optional output connectors available, contact factory for more details.